The Kershaw Scallion is another one of those timeless EDC knives that should be considered by collectors and enthusiasts alike. The Scallion is a remarkable little blade that shares some great similarities to the Kershaw Skyline, but is very much it’s own animal. Designed by custom knifemaker Ken Onion, the Scallion is a slim, lightweight knife with very fast blade deployment and superb fit and finish. If you are in the market for a high quality and affordable EDC knife, the Scallion is a blade that you may want to consider. The Scallion has an overall length of 5.57″, a 2.4″ blade, weighs 2.9 ounces and is made in the USA. This is a great size for Every Day Carry (EDC). It’s very unobtrusive in the pocket and it won’t weigh you down – excellent for urban or suburban carry. The blade is a modified drop point with a hollow grind and a recurve to the edge of the blade. The recurve is good for slicing although it makes the knife more difficult to sharpen. Ken Onion is known for designing curvy (“organic”) looking knives, and the Scallion fights right in to that theme. With that said, I would not recommend a recurved blade to a first time knife buyer. There is a slight swedge that concludes at a capable tip. This blade shape is capable for EDC tasks like breaking down boxes, opening mail, and food preparation. Because the knife is so small, I would not push the Scallion much further than that. The blade is made of 420HC stainless steel. 420HC is regarded as a low end steel, although if it is heat treated properly, it can perform fine for daily tasks. 420HC has great corrosion resistance although the edge retention is not going to be on par with something like 440C. Kershaw does a good job with their heat treat, however, I would like to see them upgrade the steel on this. If they used a Sandvik 12C28 like they do on the Leek, I think that would be an excellent upgrade. The Scallion typically comes with an anodized aluminum handle. The aluminum is 6000 series aircraft aluminum and it keeps the knife lightweight and strong. The great part about the Scallion is that there are a variety of different colors and handle configurations to choose from. This knife comes in everything from a standard satin finished blade with a black handle to a rainbow colored version that is very unique looking and everything in between. There have also been a lot of limited edition versions of the knife so if there is a particular color configuration you are looking for, it is probably available commercially or on the secondary market. The handle is comfortable and ergonomic. There is a short run of jimping on the thumb ramp of the blade, and the finger choil which helps provide good grip. Depending on the handle materials you select, there will be additional traction. This knife is easy to use and feels good in the hand. The pocket clip is rather large and only allows for right hand tip down carry. I like the option to move the clip around, and I prefer tip up carry for faster deployment so this is something of a disappointment for me, however, I wouldn’t call it a deal breaker. For an EDC knife, tip down carry is still acceptable and you will get the job done with this knife. The Scallion is a flipper, equipped with Kershaw’s Speed Safe assisted opening mechanism. The Speed Safe system was developed by Ken Onion as well, and is a very common assisted opening mechanism found on Kershaw knives. The action on the Scallion is snappy and reliable. The flipper works well, and there are phosphor bronze washers inside (although you don’t really notice with the assist). The Scallion uses a either a steel frame lock, or steel liner lock to lock the knife open. The liner lock is sturdy and more than adequate for every day carry type tasks. My lock engaged early, and there was no blade play or stick in the lock. Kershaw has their liner locks and steel frame locks dialed in pretty well, and the lock on my Scallion is no exception. The Kershaw Scallion is a capable budget EDC knife, but not without its quirks. It’s a great size for EDC, the materials are decent given the price point, the knife is well executed, is comfortable to use, made in the USA, and retails for under $50. Certainly there are some high points. On the flip side, the recurve blade makes the knife tough to sharpen, and 420HC stainless steel is on the low end of the spectrum, even at this budget price point. If you can get past those two points, then the Scallion could be a great EDC option. Personally, if I was in the market for a Ken Onion / Kershaw EDC knife, I’d go with the Leek, but the Scallion has stood the test of time and continues to be a viable daily carry option that won’t break the bank. 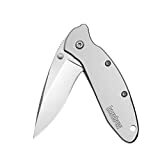 Kershaw Scallion Pocket Knife (1620FL); 2.4” 420HC Stainless Steel Blade and 410 Steel Handle, Featuring SpeedSafe Assisted Opening, Flipper, Lanyard Hole, Secure Frame Lock and Tip Lock; 2.9 OZ. I recommend purchasing the Scallion at Amazon.com or BladeHQ. Please remember that purchasing anything through any of the links on this website helps support BladeReviews.com and keeps the site going. Thank you very much. Dan….. I too am a big fan of Ken Onion and you can smell an Onion-y design from across the room. Great review of the Scallion. I’ve been using blades as tools during my 35 year history with the military and this is my EDC. I love the narrow but strong tip and the quality of lockup. The overall solidness is only appreciated with one in your hand. I was spoiled by a Spyderco Delica so I don’t like my “pinky” hanging off the end of the Scallion but it’s built like a tank, opens wicked fast, doesn’t scare amateurs, weights 2.3 oz and can be replaced for $30. Keep up the quality reviews……. Bubba, Good point! Kershaw makes so many variants of this one it’s hard to believe they don’t have a ceramic offering on the market.